On Macintosh and Windows computers, the Backup Manager is installed with the help of a web installation wizard. If you did not receive an email with a download link, click this link to DOWNLOAD AN INSTALLER for your operating system. The installation wizard guides your through several quick steps. You will require the device name and password for Step 2 below. The Backup Manager is available in many languages. Choose the language for the current installation. 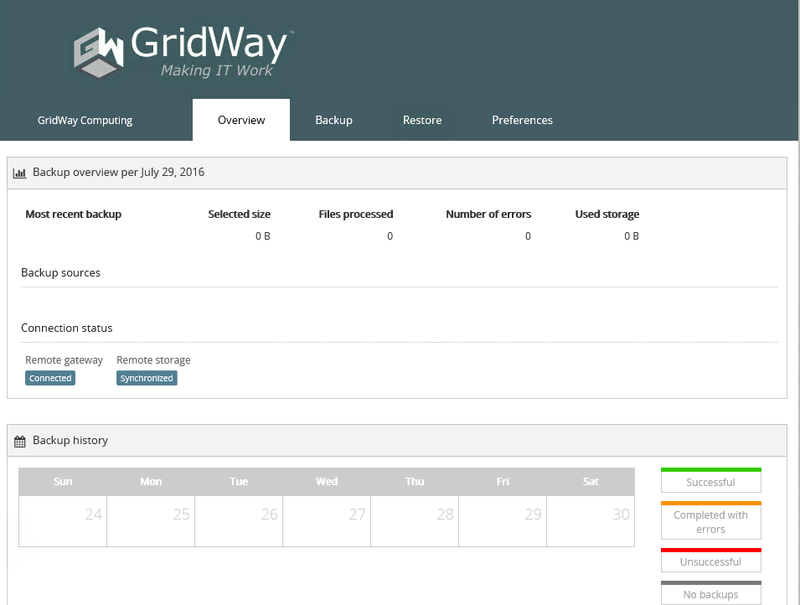 Enter your access details for the Backup Manager – you receive this from GridWay. Your device name and password is required. If you need access details, please contact GridWay for help. The Security Code is used to encrypt your data, both in transit and while stored in the backup data centre. Using this code, your private data is protected from unauthorized access. GridWay will provide you with a Security Code – the same as your device password. GridWay maintains this password securely in case you require a re-install of the software and/or a Bare Metal Restore, and you can’t remember it. WRITE IT DOWN AND KEEP IT SAFE! WE CANNOT STRESS THIS ENOUGH! It will be impossible to recover any information without this code if your existing system were to die. It can be any word or sentence of your choice. The most important challenge is finding the best code, the one that you can remember but that no one else knows or can guess. Additionally, you can choose a preferred data encryption method (AES-128, AES -256 or Blowfish-448). AES-128 is the predefined data encryption method in the Backup Manager. You can specify a time to start regular backups and choose an appropriate frequency. The default times are daily at midnight. Enter your email address to start receiving email reports on the status of recent backup activities. The frequency of report delivery is customizable. 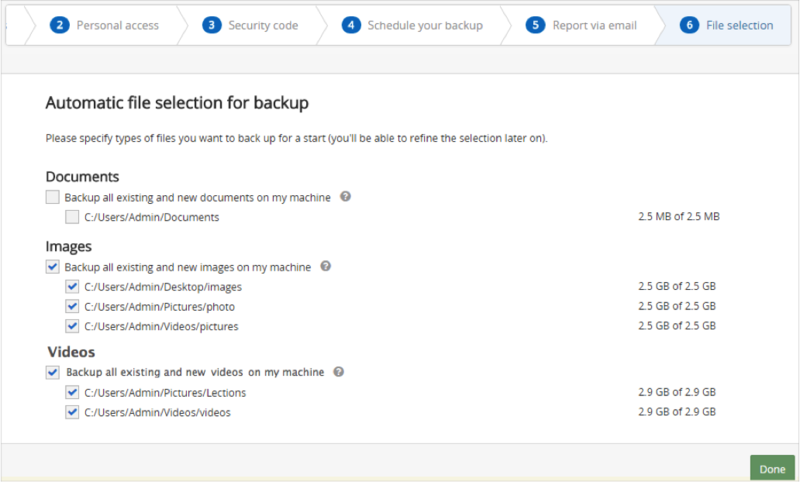 You can quickly populate your backup selection with documents, images and videos detected on your computer. Be aware that the maximum file size is 2 GB so large videos and documents will show as an error. You can change your initial choice of the file groups after the installation as well as refine your backup selection. Macintosh users perform this after the installation and should choose the user or users under the Users folder, then fine tune the selection to remove unnecessary files. e.g .Trash, Downloads, Library, etc. Once completed, the Backup Manager will launch in your default browser. From there you can fine tune all the details and features and start a manual backup. Depending on your internet connection and the size of your backup set, the first backup could take days if not weeks. We recommend you choose a small subset to begin the backup, then gradually expand it to take in all the files you want protected. Now, check the TOP 5 THINGS YOU NEED TO DO, once you’ve completed the installation.